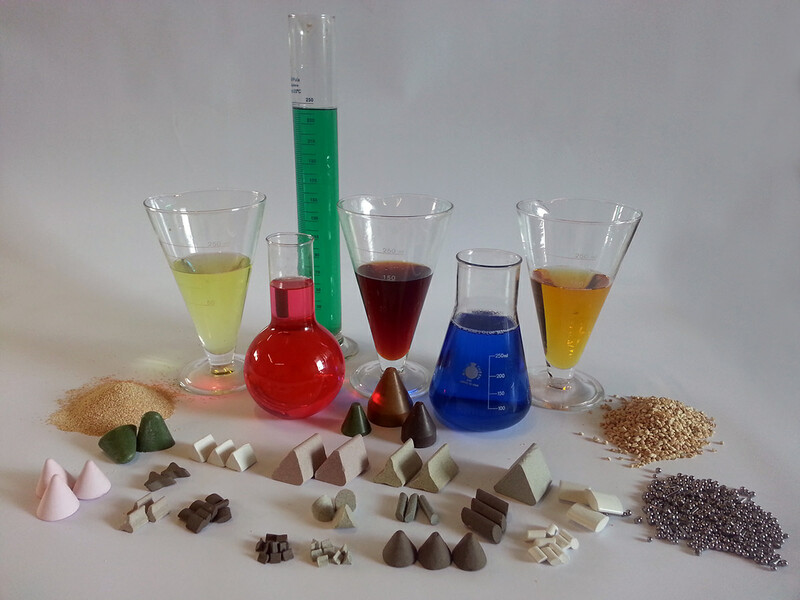 Ceramic abrasives with various grinding effects, Plastic abrasives with polyester or ureic resin, Porcelain and high density abrasives for polishing, Corn cob for drying and polishing, Stainless steel balls AISI 304 and AISI 420, Abrasive powders, Pastes for precision grinding and polishing, Polishing/neutralizing/passivating products, Products for ball burnishing, powder or liquid flocculation products, Products for chemically accelerated processes. Our test lab and our technical team are at your disposal to suggest the most suitable abrasive and compound for your specific needs. Ceramic abrasives VIBROCHIMICA are made of a homogenous mixture of metallic oxides with controlled grain size through ceramic bonds at high hardness. Our production includes different types of abrasives in function of the required cut and finish. TYPE A: Mixture made of aluminium oxides and quartz. Medium-low cut. High lifetime. TYPE S: Mixture made of aluminium oxides and corundum (7%). Medium-high cut. Good duration. Good grinding effect. TYPE B: Mixture made of aluminium oxides and corundum (15%). Fast cut with high grinding effect. TYPE C: Mixture made of aluminium oxides and corundum (30%). Rapid cut and higher grinding performance. TYPE HD: High density. Mainly used in chemically accelerated processes and/or with finishing and polishing pastes. The resulting surfaces have a very low roughness ( < 0,05 Ra). TYPE BR 7: Special mixture with high grinding effect and excellent surface finishing. TYPE KBC: Porcelain. Low cutting effect. Mainly used for superfinishing- polishing processes combined with pastes. High quality finishing. Plastic abrasives VIBROCHIMICA are made of a homogenous mixture of natural abrasives, metallic oxides with controlled grain size, polymerized resinous bonds. Our production includes 2 types of resinous bonds and various abrasives in function of the required cut and finish. TYPE PX: red colour. This type is used for roughing operations on all light alloys. Good finish. Medium-high aggressiveness. TYPE RCE: green colour. This type is used for fine deburring and smoothing of all alloys. Excellent finish. Medium-low aggressiveness. TYPE S: light blue colour. Particularly suitable for aluminium and non-ferrous metals. TYPE PH1: yellow colour. Low grinding effect. Extremely polished or semi-shiny finish. TYPE ER: Pink colour. Suitable for medium grinding on all alloys. Good finishing. Medium-high aggressiveness. TYPE FR: Light blue colour. For light grinding on all alloys. Perfect finish. Medium-low cut. Polishing media in the shape of balls, satellites or logs, made of hardened rectified stainless steel AISI 420. Stainless steel AISI 304 is also used for some processes. These media are particularly recommended for a fast and reflecting ball burnishing treatment on all metals and alloys using ball burnishing vibrators. Product of plant origin obtained by processing corn. This product is characterised by a high absorbent capability and it is suitable for drying processes in combination with chemical compounds used for polishing of metals and plastic. Various sizes are available.